Beijing has an extensive public transportation network. Subway and City Rail with high speed trains running at intervals of 3 to 5 minutes are the fastest public transportation in the city. There are more than 60 thousand taxis in the city. Public buses are the cheapest means of transportation which cover the entire city. As one of the most important construction projects for the Beijing 2008 Olympic Games, Beijing Capital International Airport Terminal 3 will start operation on 29 February 2008 after four years of construction commencing from March 2004. As the biggest in Asia, Terminal 3 consists of three concourses: C, D and E with total scale of 1 million sqm. Concourse C is for domestic and international check-in, domestic departures, and domestic and international baggage claim. Concourse D is temporarily dedicated for charter flights during the Olympic and the Paralympic Games. Concourse E is for international departures and arrivals. 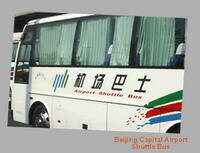 After arriving in Beijing you can go into the city by airport shuttle or by taxi. Airport Shuttle: The airport shuttle runs every 15 minutes from early 5:30 to 20:00, and cover different routes. And the cost is 16RMB (about US$2). The bus stops at certain places in the city and you can continue to other destination in the city by Taxi. Airport Taxi: The legitimate taxis in a long queue outside the Arrival Hall but taxis move quickly so you wont wait long. At the head of the line a dispatcher will give you your taxis number, which is useful in case of complaints. The charge will be at least 100RMB but pay according to the meter, which includes an expressway toll of 15RMB. After 23:00, you will pay more. Airport Rail: it will be put into operation before August 2008. 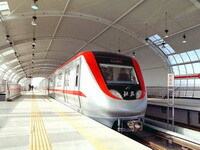 Passengers then take the Airport Rail at Dongzhimen subway station and it takes only 17 minutes to the airport. When in Beijing, you have many different choices to get around. City public buses run from 5:30 till 23:00 daily. 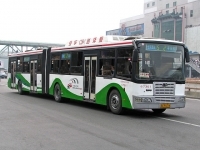 Taking buses in Beijing is quite inexpensive but less comfortable than a taxi or the subway. The flat rate for an electric car and ordinary public car is 1RMB. Buses equipped with air-conditioning or of special line are charged according to the distance. Few foreigners like getting around by bus, because it is always crowded, especially during rush hours (6:30-9:00 and 17:00-19:00). Some conductors give the stops name in English but they can’t speak any more English. Write down some commonly used sentences in Chinese is quite helpful. Minibuses, serving from 7:00 to 19:00, charge the flat rate of 2RMB guaranteeing a seat. They are faster and more comfortable. Most visitors, Chinese or foreigners will find the subway train clean, fast and relatively comfortable, except during weekends or rush hours, when the subway train is very crowded. The subway runs every 3 or 5 minutes daily from 5:00 to 22 or 23:00, according to different first stations and the fare is 2RMB per ride for any distance. There are two subway lines in Beijing: one runs under Changan Avenue and its line extends from Sihuidongzan in the east to Pingguoyuan in the west; another one circles under the northern part of the Second Ring Road. You can transfer between these lines at Fuxingmen station and Jianguomen station with no transfer fee. Subway entrances are show on city maps. Each station usually has four entrances. The entrances can be identified by a large blue sign with letters BD inside a circle. If you still can not find it, you may ask a Chinese "di tie”. Walk down stairs to enter a station the tickets are sold above the platform. When going down to the platform, hand your ticket to the checker at the top of the stairs. On tunnel walls of the platform, you can see signs and maps in Chinese and Pinyin indicating the next station and helping you to decide which subway train to take. Over the door inside the train you also can find complete system maps in Chinese and Pinyin, and an announcement tells you the name of the next station both in Chinese and English. If you find you are on the wrong train, you can just get off at the next station, (It usually takes about 4 or 5 minutes to travel between stations. ), and get on the train running to the opposite direction. No transfer fee will be charged. Its very easy to hail a taxi anywhere in Beijing. 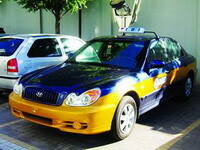 Taxi is the preferred transportation choice for most foreigners, because they are inexpensive and plentiful. The taxi charges 10RMB for the first tour within 4 or 5 kilometers and 1.2, 1.6 or 2RMB thereafter per kilo. The bridge and road tolls will be paid by passengers. For a journey that takes longer than 10 kilo or running after 23:00, the fares will be charged at 50% more. Ensure that the driver starts the meter. You can ask for a receipt which will have the number of the taxi printed on it. Have this handy in case of complaint. Most drivers can’t understand English, so write down your destination in Chinese beforehand. For taxi complaints, ring 6835 1150.